We believe that inequality is not inevitable. Rather, it is but an outcome of poor and irresponsible political choices, made by governments and by the powerful. 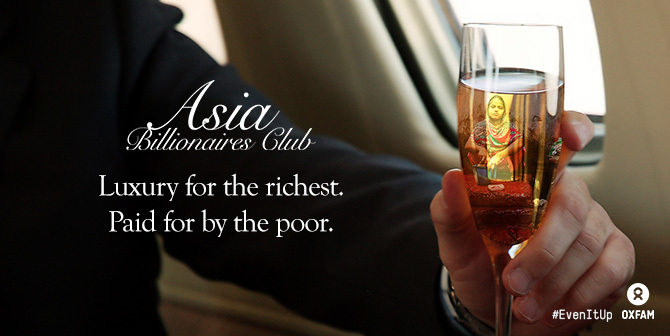 Asia’s rich are getting richer, but why are the poor are only getting poorer? We live in a world where rich corporations and individuals find ways to manipulate tax laws and avoid paying their due share, leaving the poor to suffer the consequences. Governments in Asia are unable to collect adequate taxes because of tax dodging. In return, not enough funds are going to essential public services such as universal healthcare, education and social protection. As a consequence, the poor are not given the opportunities to go to school, access information, and afford quality healthcare. Low wages, and lack of respect to labour rights are also worsening inequality in Asia. Corporate profits are enjoyed only by those at the top; while minimum wage workers, small producers, fisherfolk and women remain powerless, unheard, and unable to earn enough to escape poverty. Extreme inequality hits women the hardest in Asia. They are the lowest paid, most precarious, and unsafe at work. Women in Asia also carry out the majority of unpaid household chores, taking up too much of their personal time; limiting them to pursue careers of their choice and play an active role in society. Oxfam believes that inequality is not inevitable. Rather, it is but an outcome of poor and irresponsible political choices, made by governments and by the powerful. Equal access to knowledge, technology and natural resources is essential to narrow the gap between rich and the rest in Asia. Oxfam, through the Even it Up Asia Campaign works with governments, regional institutions, international organizations, women’s rights groups, and civil society organizations in the fight against inequality. We advocate for policies that champion fair taxation, labour rights, living wages, progressive public service spending, women’s equal access to labour and market, and equal wages for both women and men. We call on Asian leaders to put into action their lip service to ‘inclusive growth’. Governments must set national timebound targets to reduce the gap between rich and poor. Leaders must work together to put a stop to tax evasion and tax dodging, and create tax systems where rich individuals and corporations pay their fair share. Governments should reaffirm their commitment to increase resources for essential public services such as education, health and social protection. They should respect global targets to spend a minimum of 15% of their budgets on health, and 20% on education. Leaders should legislate and implement living wage, to increase wage standards enough for workers and their families to be able to afford to live decently, and escape poverty. Governments should empower women in contributing to the economy. They must ensure and expand women’s access to credit and capital, and invest in enabling women to put up and manage their own businesses. They must address the burden of care work on women, by extending and expanding public services aimed at supporting, reducing, and redistributing unpaid care work. Leaders must create an enabling environment, in which citizens contribute to decision-making, making sure that workers are represented in corporate structures. Governments must measure progress in reducing inequality. Countries in Asia must set clear national targets to reduce inequality, and collect accurate data on top incomes and wealth. Join us in making Asia a just and fair place for you and the future generation! Let’s make our part of the world more peaceful, inclusive, and sustainable; where prosperity is shared; where women enjoy the same rights as men; and where work is more rewarded than wealth. Join us as we demand on leaders, decision makers, and businesses to tackle extreme inequality, before it is too late. Follow us on Facebook and Twitter to get up-to-date information about our latest campaign calls.